It’s our last day in Ettalong and we decided to make the most of having a beach right on our doorstep, pretty much what we’ve been doing since we got here. 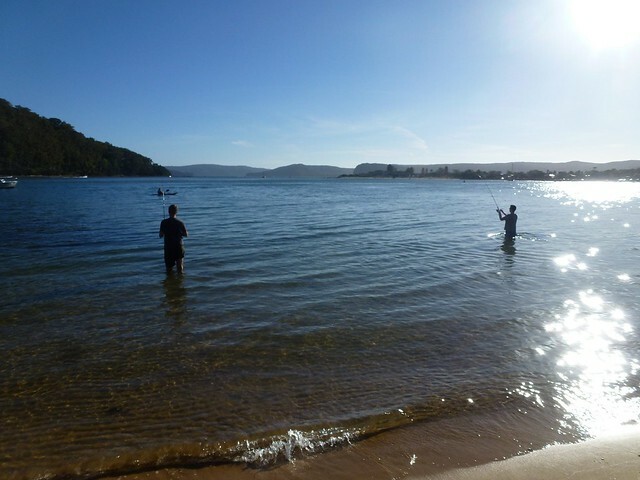 We walked along Ettalong Beach and then all the way along Umina Beach, finishing with an ice cream on Umina beach. 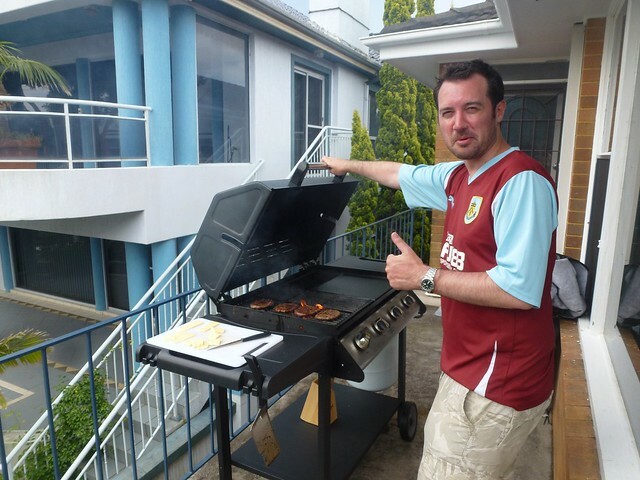 For lunch we grabbed burgers and used the BBQ on the balcony for a good last meal in Ettalong. Tonight, we would be getting the overnight train to Melbourne. In the evening Alan and Andrew were going to the football to watch the Central Coast Mariners who played in Gosford. Before the match we all headed to Alan’s and Andrew’s friends who they had met at the football before. They had a really nice house just outside of Gosford. We had a couple of beers, some food and an interesting chat about living in Aus. The main conclusion was that it was nice, the standard of living was good, the beach lifestyle was enjoyable however at times there was something missing. Alan took us to the train station in Gosford, we said our goodbyes and headed into Sydney to get our overnight train to Melbourne. Our train departed at 8:30 that evening and we were due to arrive in Melbourne Southern Cross station at 7:35 tomorrow morning. 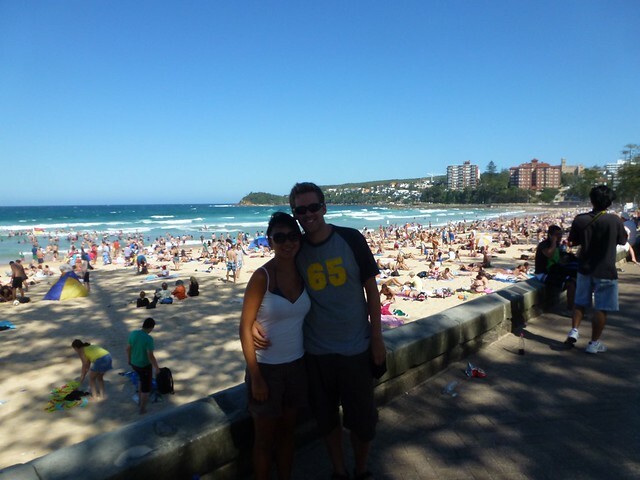 With Alan having no work we decided on a day trip to Manly. 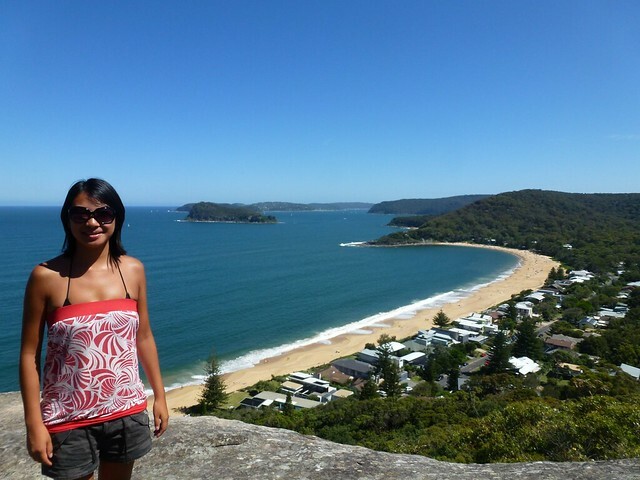 Located north-east of Sydney, we had to get the train into Sydney and then jump on the ferry to Manly. 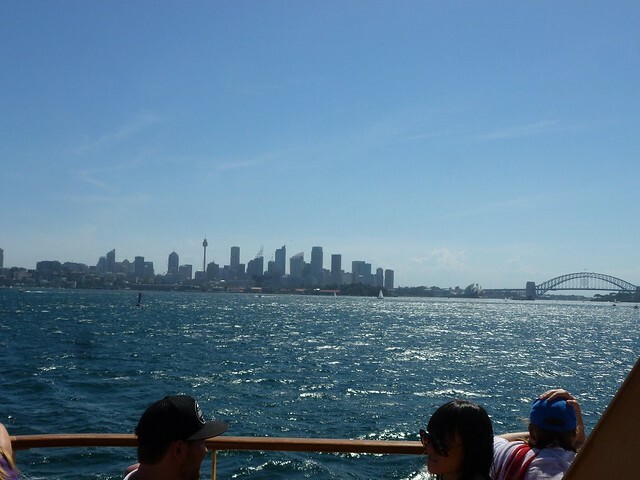 It was a picturesque ferry trip going under the Sydney Harbour Bridge and past the Opera house. It was a sunny day but pretty windy down on the coast. Manly is a hot surfing spot but with the wind and the larger than average waves, people were only allowed to swim in a small 30 metre section. Patrolled by a jet ski the swimmers were kept in a box while the coast guard barked warnings to the swimmers. Very strange indeed but I think a common site in Australia. Further up the beach we were able to watch some surfers, including some people having surf lessons. We walked from one end of the beach to the other admiring the sea view houses and flats. By the time we got back up to the main beach the place was packed with people catching the last of the sun. In the evening we headed back to Andrew’s which would be our last night in Ettalong. We cooked that evening as a way to say thanks to Andrew and Alan for letting us stay and feeding us. 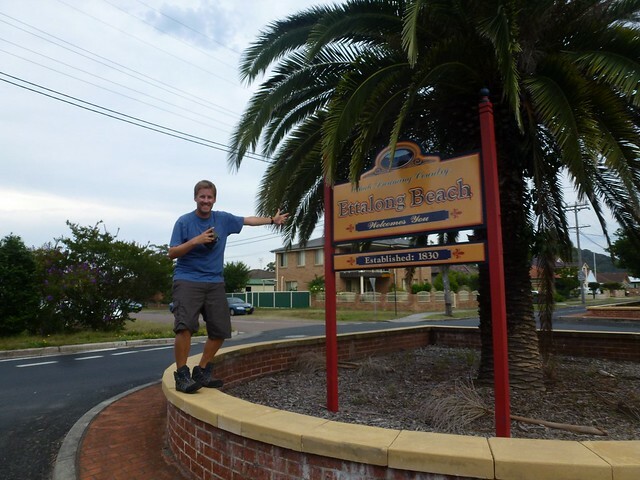 With the sun beating down, we decided to head over to Palm Beach, which is part of the set used in the oh so famous Australian soap Home and Away. With no plans to visit the Neighbours set, this was probably as close as we would get to going on a tour of either soaps. From Ettalong, we caught a ferry from outside Andrew’s house directly to Palm Beach. It was about a 25 minute journey which was perfect and so easy to get to. We also took our fishing rods with us after no luck last night as well as nice little picnic. The four of us headed out mid-morning and before long, we were at Palm Beach. 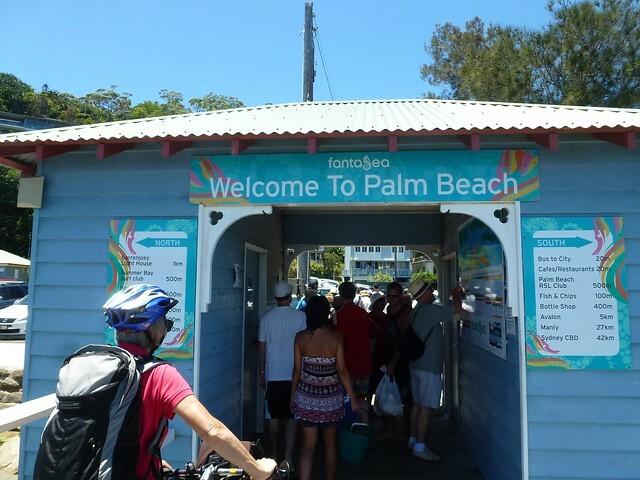 Palm Beach is a very affluent area which was reflected in the numerous posh private boats anchored near the bay. We found a nice little fishing spot for the boys whilst I sunbathed. The boys only managed to get a few nibbles and nothing suitable for dinner. We spent around 4 or 5 hours at the beach and before long, we had a couple of very sunburnt boys. We decided to head back mid-afternoon and caught the ferry back to Ettalong. It was so easy and quick to get to from Andrew’s! A perfect location! In the evening, we bought a few take-away pizzas from over the road and just relaxed. It’s been another great day! We had good sleep after getting to bed at 4-ish. It was a glorious day in Ettalong so we decided to go for a walk on the beach which was right on our doorstep. 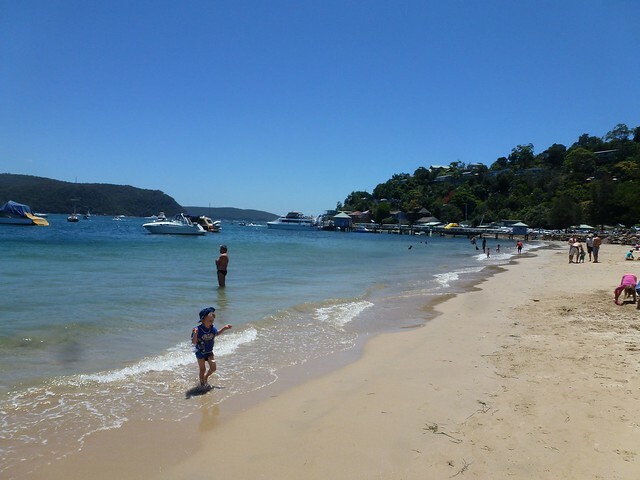 The walk did us good and we then headed along in the car to Patonga Beach just down the road. We ate at the Patonga Beach Hotel, very nice fish and chips! 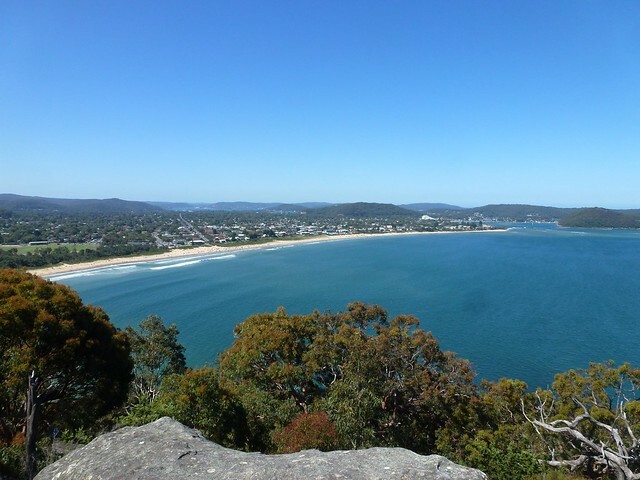 On the way back we headed up to a couple of lookout points, Warrah Lookout and then Mount Ettalong Lookout which had views of Ettalong beach and even to Gosford. After the walk and the views we headed to the shop to get some food. We grabbed ingredients for a huge salad after not eating the healthiest food for the past few days. 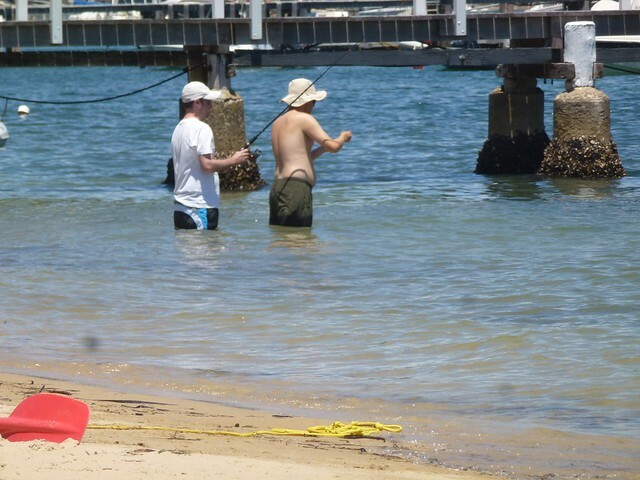 The boys then tried some fishing, Andrew with his new rod as a christmas present. John with the rods that we would be leaving at Andrew’s. No luck with a fish but they didn’t mind considering the view right outside of Andrew’s house. We’re in Australia for New Year’s and how else are we to spend it other than admiring the fireworks over Sydney Harbour Bridge?! Arriving in Ettalong last night, this was always the plan for New Year’s. 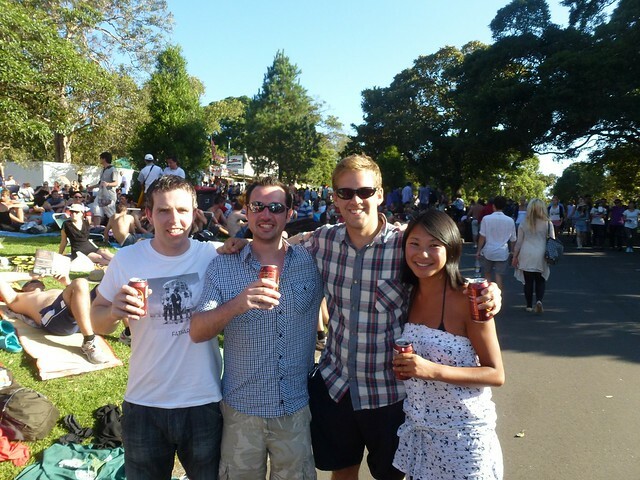 After a bit of a lazy morning, the four of us (me, John, Al and Andrew) set off from Woy Woy train station with sandwiches, drinks and a bag of goon which we would try and sneak into Mrs Macquarie’s Chair, a free viewing point for the new year fireworks. Because the entrance was free to this place, no alcohol was allowed to be brought in. 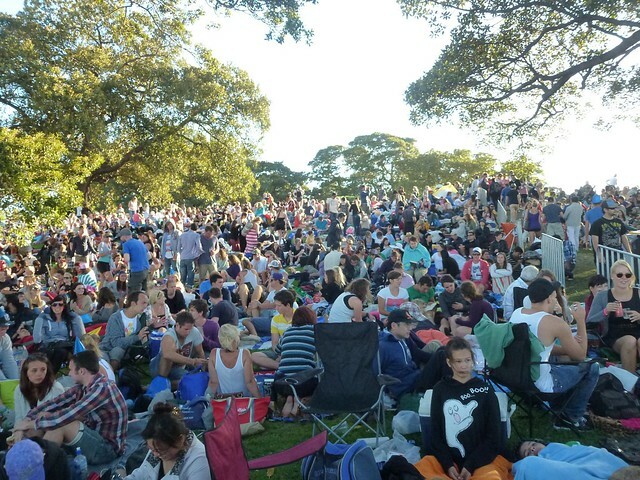 We decided to try our luck anyway as a friend of mine who has spent a previous new year at Mrs Macquarie’s Chair had told us that they had managed to sneak in a bag of goon by wrapping the bag inside a towel. With inflated alcohol prices, decided it was worth a shot so we wrapped the goon in Al’s towel and placed it at the bottom of John’s rucksack. 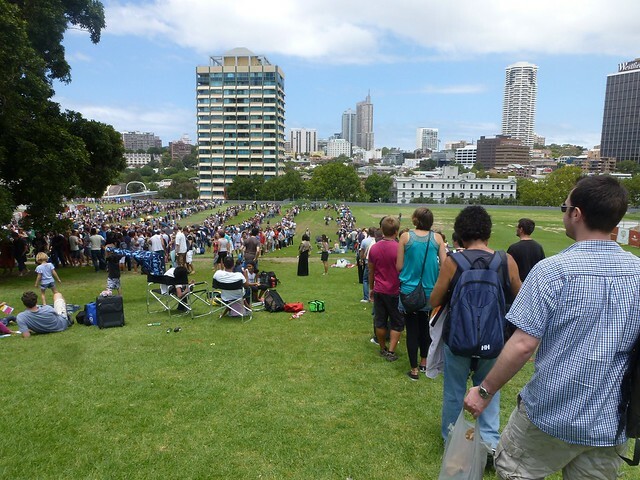 When we arrived, we headed straight to the viewing point but we appeared to have joined a little late around 2pm with the queue snaking around the grounds about 1,000 persons deep! As we moved along the queue, we took it in turns to hold the rucksack with the goon in as it was quite heavy. Come Alan’s turn, the strap snapped and the bag fell to the floor, smashing open the bag of goon. The red good went everywhere, all over the bag and we had to throw it away along with the goon-drenched towel. It wasn’t a great start! After two and a half hours queueing, we finally got in and grabbed a spot near to the action. 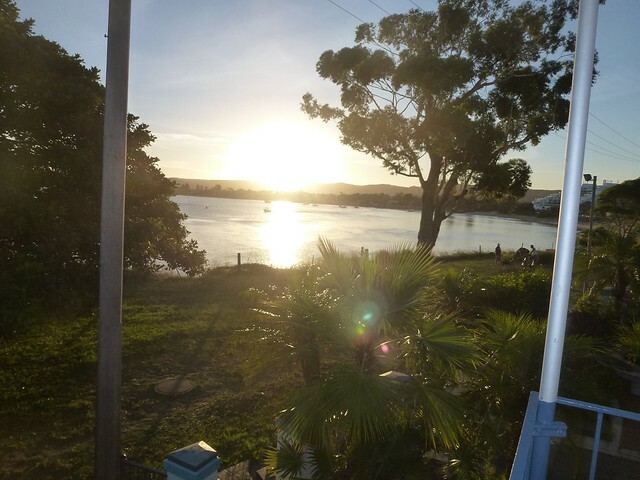 The weather was great allowing for a bit of sunbathing and drinking – a 330ml can of beer cost A$7 (c.£5) but if you returned your cans, you would get a dollar discount on your next beer which was better than nothing. There was a great atmosphere with everyone in a jolly and relaxed mood. There was a real mix of people including backpackers, locals and families. 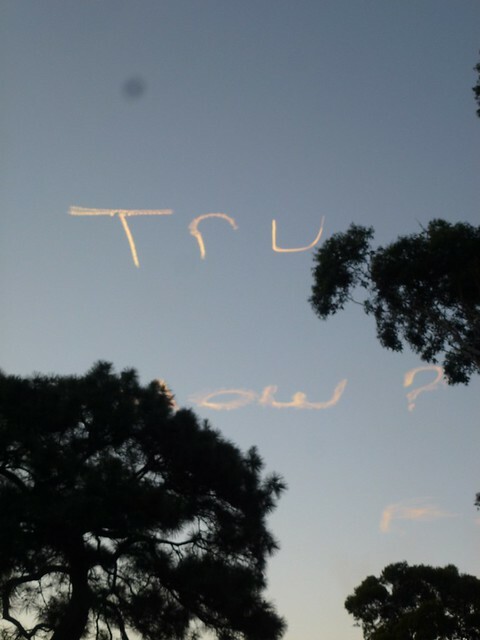 Whilst we were all waiting for the first round of fireworks, entertainment included an airplane writing a cryptic message in the sky and several flyovers. We even bumped into Sam and Minh, the Chinese-English couple we met in Cairns. They had a better spot than us right on the bank but there was no room for us. It was nice to bump into them anyhow. 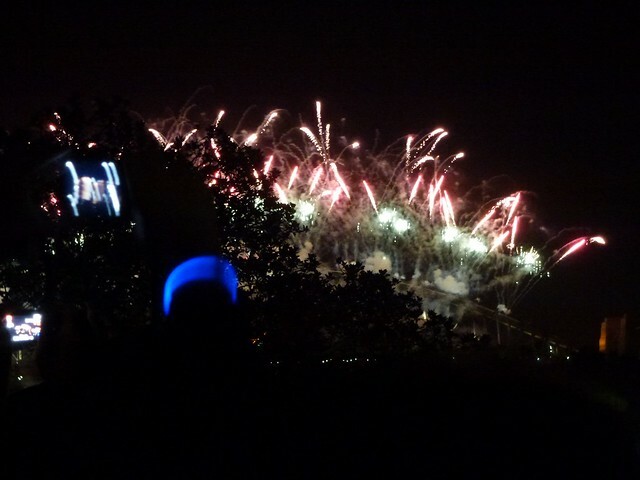 The first round of fireworks were let off at 9pm and by midnight, it had quietened down a bit after families had left with their young’uns. But it was still very busy. For the midnight showing, we managed to move to a better position though we still had a rather large tree obstructing part of our view. The fireworks were great and it was a perfect way to spend New Year’s and best of all, we managed to spend it with a couple of friends from home. After the fireworks, we were ushered out by the security guards. On the way out, we bumped into Minh and Sam again and wished them a happy new year. We finally managed to get to the train station and caught a direct train back to Woy Woy. Luckily, we managed to get a seat on the train and drop off for a little during the 1 and a half hour journey. We caught a taxi back to Andrew’s and called it a day and headed off to bed around 3.30am. 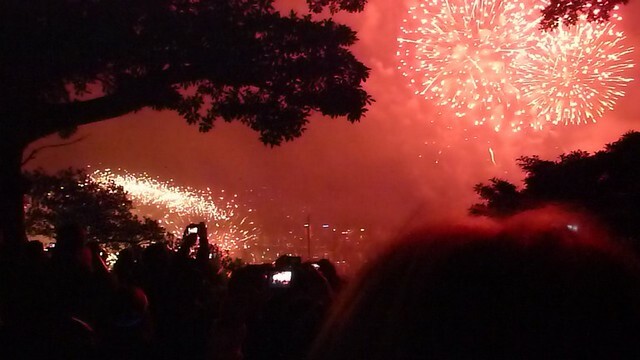 It’s been one of our best New Year’s Eve without a doubt!